Supply remains low. Will demand follow? Low supply has stubbornly remained the major theme of the housing market for the last three years.Â In fact active counts of homes for sale were lower in only 4 years (2004, 2005, 2012, & 2013).Â In 2004 & 2005 â€œthe bubbleâ€ was underway with heady demand voraciously consuming inventory.Â In 2012 & 2013, buyer demand was stimulated by 2011â€™s â€œbottom of the market pricingâ€.Â Thankfully 2017 is neither a bubble market nor a bargain basement sale â€“ but rather a normal sellerâ€™s market. Supply is the easier of the two factors (supply & demand) to quantify.Â So how do we track demand relative to supply? The Cromford Report answers this dilemma by using an interesting tool to gauge the state of the market (i.e. supply vs. demand) called the â€œContract ratioâ€.Â The contract ratio specifically measures the number of completed sales contracts relative to the supply of active listings. For those who enjoyed their grade school math class, it is specifically â€œ100 x homes under contract divided by active listingsâ€; the higher the number the greater the buying activity relative to supply. 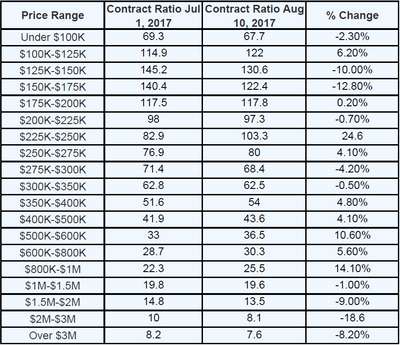 We mentioned (on August 7) signs of cooling in the $150K to $200K price range for single family homes. However this is swamped by the heating up in several of the higher markets, particularly $225K-$250K and $350K-$1M. â€œAppreciation is fine for the home owner, but translates into loss of affordability for the potential home buyer. Prices are being driven higher by a natural and persistent lack of supply, not irresponsible speculation. In this situation it is normal for prices to rise until they suppress demand enough to match the weak supply and we reach equilibrium. That is fundamental to economic theory. So we should not be surprised if sales volumes lose some of the momentum they have seen during the first half of 2017. Whatever the market brings we will endeavor to keep you apprised.Â Of course, we always welcome your comments or questions.